There's no place like home... there's no place like home... but who'd want to stay home when you could go out wearing these shoes and delight the eyes of everyone you meet? 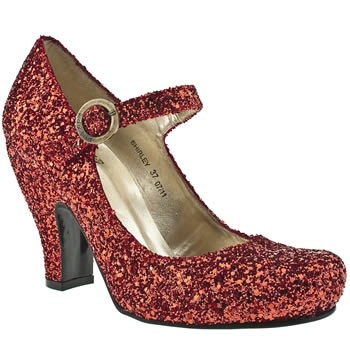 These beauties are my latest purchase, an exclusive to Schuh by Red or Dead. They were sold out in their Manchester store, as I imagine they are up and down the country due to their squeal-inducing desirability, so I bought them online with free delivery after trying on the plain black leather version instore for fit. The glitter version is in manmade materials so suitable for discerning vegan tootsies, and is available in shimmering silver too. I love the shape of the heel, which is quite reminiscent of curvy 1940s styles. I plan to get lots of wear from these as being ruby coloured they also fit in with my Autumn wardrobe plan, some pieces from which I have completed and will be showing you all soon! This week I also picked up the cherry print duvet cover and pillowcases pictured above, they're lovely and from Tesco. Ooh.. twinkly. And I also now wish our tesco sold bedding. Do you want me to get you one Ginny? It's £13 for the double set. I love my new shoes :) I wore them while I was making my tea.